No one other than Coppola could have directed The Godfather, because the mental effort to work Puzo’s world into film is on the level of science fiction. The Godfather was, and always will be, associated with the man who took Mario Puzo’s novel and turned it into what many consider the best or perhaps the second-best film of all time (often losing to Orson Welles' Citizen Kane). Francis Ford Coppola has written, produced, and directed over 40 films, but he will always be known for The Godfather. And yet, almost half a century after its debut, I found myself in the remarkable situation recently of learning more about Coppola and the making of the film than I had previously known, thanks to the release of Regan Arts’ The Godfather Notebook. I began the notebook by dividing the novel into five acts, and then subdividing those into fifty sections, or scenes, each separated in the binder by a numbered tab. These were divisions I elected to do; in other words, I wasn’t necessarily following the chapters in Mario’s novel. Sometimes my sections corresponded to the actual chapters of the book, but sometimes not. Then, Coppola added a cover sheet for each of the 50 sections that included five topics: 1. synopsis, 2. the times, 3. imagery and tone, 4. the core, and 5. pitfalls. The result is this “notebook” -- a gorgeous hardcover that includes Coppola’s initial thoughts about the film, wonderful black and white and color photographs from the set, his handwritten notes from rereading the novel, and ideas about how major scenes could be adapted to a film. The guests are relieved and anxious to enjoy themselves on what is probably the first big affair since the end of the war. Their sons are safe. There are lots of pretty young Italian girls, who probably cluster around the servicemen. Two elements of The Godfather Notebook particularly stand out. First, the value and power of these photographs cannot be overstated. There are many famous stills taken from the original film, but to see iconic photographs with Coppola adds a new element. The director standing behind Vito Corleone (Marlon Brando), while filming the scene with Amerigo Bonasera (Salvatore Corsitto) at the beginning of the film; Coppola having a seemingly normal conversation with Brando leaning against the front bumper of a car, during the pivotal scene where he is shot during an assassination attempt; and a wonderfully candid shot of Brando, Bonasera, and Coppola in the mortuary scene where Brando shares a smile with Sonny Corleone (James Caan) who is supposed to be dead … again, these photos actually made me love the movie even more. SYNOPSIS: Woltz wakes up very early in the morning and finds something damp in his bed. He turns on the light and finds that he has blood on his hands. He traces the wetness of the blood, until he sees the head of his $600,000 race horse, Khartoum, has but (sic) severed from the body and put in his bed. IMAGERY AND TONE: Perhaps a silent move from the exterior of the house with noone around (interestingly like the hospital of later scene) … Into the house, through some of the main rooms, almost like some unwelcome intruder’s point of view (Luca?) -- noone around; the time -- early in the morning -- up the stairs; noone around. Into the bedroom; Woltz is asleep: we could kill him. Some slight is beginning to illuminate the room. I don’t see the shadow image as in the Puzo screenplay. How could that be. Rather I like the idea of him waking, and eventually feeling something wet. Then feel the wetness, and seeing it is blood, and he (and we) thinking it is his, then he quickly sits up, already in a level of terror from the blood in his hand, and sees the severed gory head of Khartoum. His scream should be enormous, and continuous for a long, long hysterical time. Somehow this might make the audience understand that Woltz realizes it could have been him. PITFALL: “That it is not horrifying enough. If the Audience does not jump out of their seat on this one, you have failed. Too much in the Corman Horror film tradition, would also be a mistake. One must find the perfect balance of Horror without losing the thread of the overall film. Deliver it, and get out. 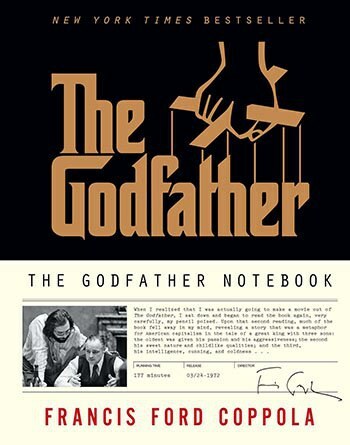 The Godfather Notebook is a stupendous book and wonderful gift to any serious fan of the original film, but its utility is much greater than that. The Godfather Notebook must become the reference volume for any and every aspiring screenwriter and director. 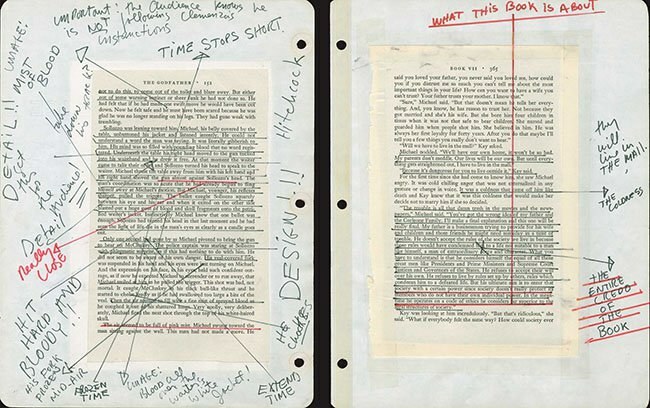 While the actual film is all the evidence one might need of Coppola’s eternal legacy, this notebook shows us that even in an age of utter media saturation, the creative spirit must still be awoken through deep reading, margin scribbles, and meticulous research. And blood. Plenty of blood.